Here’s the most recent update from Lena Forman (UVM ’08) who’s volunteering for Grassroot Soccer in South Africa — our main partner in developing the Futbol para la Vida HIV/AIDS prevention education program with partner communities in the Dominican Republic. 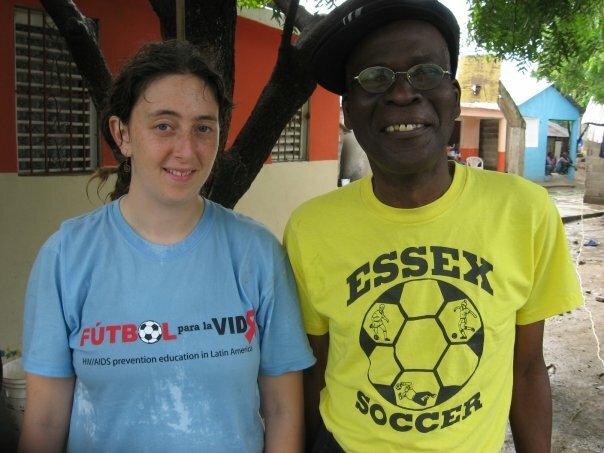 Lena helped to develop the web page of FPV and started our annual University of Vermont barefoot soccer tournament and fundraiser during her studies in Community Development. Go Lena! I hope all is going well since I last wrote! A lot has happened in my world since then for sure! Since my last email I have had the opportunity to explore Cape Town more including visiting some townships in the area, we started learning more about Grassroot Soccer (GRS) including the curriculum, we met trainers from all over South Africa as well as some other African countries, and, lastly, we learned where we are being placed for the rest of our time as a field interns. Firstly, I got to experience one of the most beautiful places I’ve ever been two Saturdays ago when me and most of my fellow interns hiked up Lion’s Head. I did take pictures but my photos don’t do it justice so if you would like to see what and where I’m talking about you should do a Google search for “Lion’s Head Cape Town”. It was a really nice hike and even included climbing up some chains and ladders to get to the very top (you’ll see what I mean when you find a photo). We also visited both the townships of Khayelitsha and Langa. A township is a community that was created by the South African government during apartheid where people who were not white Afrikaans were sent to live. The conditions were bad and still continue to suffer although some areas are getting better. In a township you can see anything from a lot of tiny tin shacks to a nice cement block home with a fancy car in the driveway. We also went to Robben Island where political prisoners like Nelson Mandela spent much of their imprisonment during apartheid. Our tour guide was actually a former Robben Island prisoner himself so it was really interesting to hear talk about his own experiences as well as give the tour. Last week we had a training in which current GRS coaches/trainers from Cape Town (SA), Port Elizabeth (SA), Bloemfontein (SA), Lusaka (Zambia), and Nairobi (Kenya) came to Cape Town and we had a week-long training where we learned more about Grassroot Soccer, heard about their personal experiences with the program (because they are all top trainers in their respective communities), and learned from each other. These were some of the most amazing people that I have ever met! They are so passionate in what they are doing and are so smart and articulate in their thoughts and ideas. All of us field interns felt so inspired by them and their energy. I can’t begin to explain how much I learned from them during the week and how close our two groups came to each other. We had so much fun together both during our training sessions and after just hanging out. To see one of the amazing women that we met (named Titie) you can watch this 20 minute video that was made about GRS and features her (http://www.globalonenessproject.org/videos/agameforlife). During our week of training together we learned about the history of GRS, the different project initiatives that are happening all over Africa that GRS is involved in either directly or through partnerships, we learned what it takes to run a successful program, we did a diversity training as well as a gender sensitivity training, we learned bits of some of the local languages, and we learned about HIV/AIDS in Africa and the social context as well as had a doctor speak with us about exactly how HIV/AIDS affects the body and how it is spread and was open for all of our questions. This week (going on our 3rd week here in Cape Town) we are attending a Training of Trainers (TOT) in which new trainers from partnering organizations (not the trainers that we spent the past week with) along with us are being trained in how to deliver the curriculum to kids. The only difference with us, however, is that us field interns will mostly likely not be delivering the curriculum directly to kids. We are here as a support to those local trainers who will run the program with the kids and to help out with much of the organizational work as well as working on other GRS projects. We are going through this TOT though so that we can all fully understand exactly how the program works because the actual curriculum is really the main component of the organization and the program that it runs. As for what GRS has in store for me in the future, this past weekend we all finally got our placements for the rest of our year here and I found out that I will be headed to ZAMBIA!! Me and my fellow field intern Stuart are going to be the only two from our intern group working outside of South Africa and will be living and working in and around Lusaka, the capital of Zambia. Zambia is one of the flagship sites of GRS so there is a GRS office that we will be working out of along with the other current Zambia staff. We were fortunate enough to meet Gesh, one of the main Zambian trainers, during the training last week and got to know him very well. I am really looking forward to working with him and his crew in Lusaka because I can only imagine what it will be like if the rest of the staff are like him. From what I’ve heard so far about the role Stu and I will be playing, it looks like we will be helping to manage some of the local programs that are happening in the area as well as helping to set up a VCT tournament in Lusaka. ‘VCT’ stands for ‘Voluntary Counseling and Testing’ and the way that these tournaments work is that it runs like a regular soccer tournament except that instead of getting points just for winning games, participants also get points for taking an HIV test where qualified people are administering the counseling and procedures that go along with an HIV test. We will find out more details soon and will be staying in Cape Town for a few more weeks while our housing situation gets set up in Zambia. Some of my other fellow field interns are going to be headed to Port Elizabeth, others will be staying in Cape Town, and the others are going to be living in Kimberley (central South Africa) and traveling to many of the DeBeers mining townships (I think there are about 6) where the GRS curriculum is being delivered. Ok, I think that’s enough of an update for now. Please write me and let me know how things are going for all of ya’ll!